Combine egg/water and melted butter/marg in a jug, pour into bread machine. Add flour, sugar and yeast. Bake on ‘Dough’ setting (1hr 25 mins). When cycle completed, remove from machine and punch down dough. Divide into dinner roll sized rounds. Place 2 inches apart onto a greased baking sheet. Cover and let rise in warm, draft free place for approx 30 mins or until double in size. Preheat oven 180c. 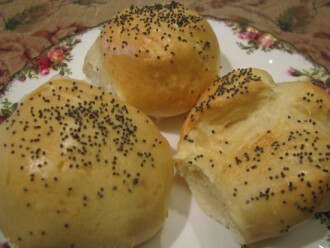 Brush tops of rolls with glaze and bake in the oven for approx 10-15 mins or until golden.